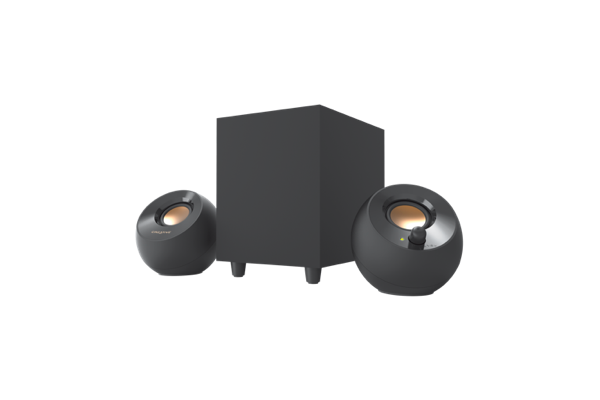 "Featuring formidable 2-inch mid-range drivers that are angled perfectly at 45 degrees to ensure that the sound reaches you through a precise and elevated sound stage, the Pebble Plus speakers are designed with the user as the center of attention. Together with the addition of a brand new 4-inch down-firing ported subwoofer, Pebble Plus simply puts the user in the audio limelight," says Creative. The Sound Blaster-maker further explains, "Powered entirely by USB connectivity, Pebble Plus provides additional convenience by eliminating the need of a wall power socket. Devices are connected to the speakers through the universal 3.5mm AUX-in cable. The front-facing controls are located at the front of the main speaker for quick and easy access. With a simple switch of a button, Pebble Plus is driven into High Gain mode, increasing its power output to 8W RMS for stronger bass and room-filling audio -- at zero loss to audio quality!" Believe it or not, the USB-powered Pebble Plus will only cost $5 more than the non-plus variant! 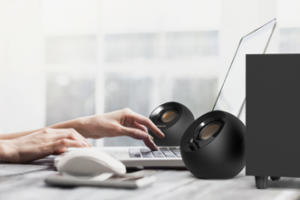 Yes, for just $29.99, you can score yourself a nice little 2.1 speaker system for an office, bedroom, or other small place. Pebble Plus will go on sale next week, April 19. 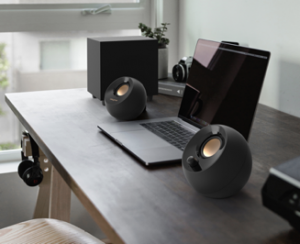 Keep in mind, while these speakers are designed for a computer, you can use them with any 3.5mm device (iPod, Echo Dot, etc.) -- as long as you plug the USB port into an AC adapter -- any USB-Type-A charger you have lying around the house should work fine.